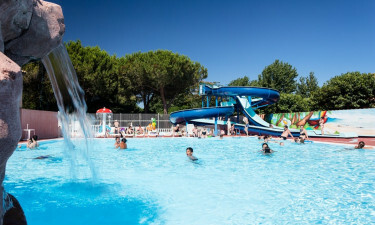 The holiday camping site of La Maire offers enough tranquillity to remove all tensions from stressed adults, and enough activity and entertainment to fulfil a child’s notion of a luxury camping holiday. Let LUX-camp secure your mobile home at La Maire to ensure that the whole family enjoys the perfect get-away. Once adult spirits have been revived they will discover the wealth of sporting activities and sightseeing opportunities that this luxury campsite, as well its surrounds has to offer. Outdoor pools and ocean waters to be enjoyed. Great food available in an on-site restaurant, or from take-away services. Enough entertainment to keep the children thoroughly amused. The city of Sérignan only 5 km away. A mobile home at La Maire rented via LUX-camp provides 2 and 3 bedroom options, which will accommodate 4 to 6 people comfortably. Set in beautifully shaded pitches, the mobile homes offer a tranquil place in which to relax, while a terrace allows for a closer encounter with nature, or for friends and family to be entertained outdoors. Although La Maire is only 600m from the beach, Sérignan is a mere 5 km away. 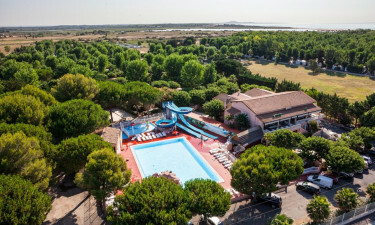 This means that camping luxury here includes access to further long stretches of the magnificent South of France coastline, so that options are many for acquiring that much-envied holiday tan. If lazing on a beach is considered a little too sedate, then boating or yachting are thrilling alternatives. Travelling 15 km from the La Maire luxury camping site brings visitors to the ancient city of Béziers. 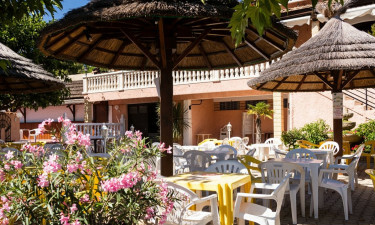 The bar and restaurant at La Maire provide well for leisurely drinks and healthy appetites with tasty traditional, as well as international dishes. 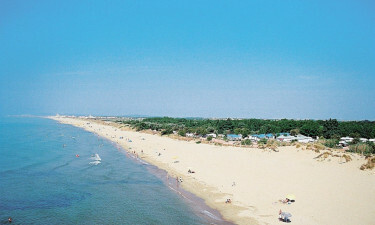 Those who prefer their luxury camping holiday to keep on the move are well served by a pizzeria and on-site snack bar. However, visits to nearby villages and cities will produce a mouth-watering variety of tempting traditional cuisine accompanied by the renowned wines produced in the region. Bread straight from the oven is available daily at this luxury camping site, while a supermarket takes care of general luxury camping requirements. Béziers was once a bustling Roman military colony, which means that luxury camping will include visits to the many Romanesque relics to be seen here. Having survived many centuries, there are also fascinating examples of Gothic and Baroque style architecture, particularly churches and cathedrals from the 12th and 14th centuries waiting to be explored. 4 km west of Béziers is an excavation of an Ibero-Greek settlement that dates back to the 3rd and 4th centuries BC. Lovers of ancient artworks will thrill at the exquisite paintings and antique Greek vases on display at the fine arts museum, Musée des Beaux-Arts. All of these treasures make a La Maire camping holiday an educational, as well as a fun experience.